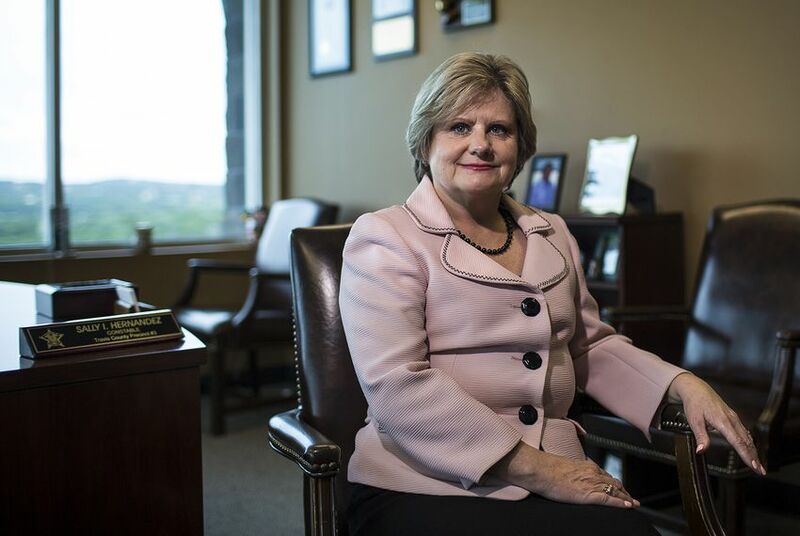 A Friday announcement by newly-elected Travis County Sheriff Sally Hernandez that her office would reduce cooperation with federal immigration authorities will set up a showdown with Texas Republican leaders, especially Gov. Greg Abbott and Lt. Gov. Dan Patrick. Editor's note: This story has been updated with reaction from Gov. Greg Abbott. Newly-elected Travis County Sheriff Sally Hernandez on Friday made good on her most controversial campaign promise, announcing that her department would reduce its cooperation with federal immigration authorities when they request an inmate be flagged for possible deportation. The announcement will undoubtedly set up a showdown with state Republican officials, especially Gov. Greg Abbott and Lt. Gov. Dan Patrick, who have pledged to eliminate "sanctuary cities," the common term for cities where law enforcement doesn’t enforce immigration laws. “The public must be confident that local law enforcement is focused on local public safety, not on federal immigration enforcement,” Hernandez said in an online video. She added that her jail can’t be seen as a holding tank for federal immigration offenders and that the policy change will save taxpayer money. Hernandez also expressed doubts that holding a person longer than legally required isn’t a violation of that person’s rights and said her duty as a sheriff is to protect the local community. “This office will not increase our liability or set unwise public safety priorities simply to ease the burden of the federal government,” she said. In a two-page memo, the Travis County Sheriff's Office said it would still continue to hold people charged with very serious crimes, including capital murder, first-degree murder, aggravated sexual assault or human smuggling. Hernandez said she would honor requests from the federal government if its officers follow due process and obtain a warrant from a judge ordering the confinement. Abbott reacted to the news swiftly. "The Governor's Office will cut funding for Travis County adopting sanctuary policies," he tweeted Friday evening. "Stiffer penalties coming." The announcement comes after lawmakers in Texas have already filed several bills that would penalize sanctuary cities, including Senate Bill 4 by state Sen. Charles Perry, R-Lubbock, and House Bill 889 by state Rep. Charlie Geren, R-Fort Worth. The proposals would allow local police to enforce immigration laws, but only if the officer is working with a federal immigration officer or under an agreement between the local and federal agency. Hernandez’s supporters praised the decision in a statement issued late Friday afternoon.